Emergency Fire & Safety’s Kevin Howlette has worked in water rescue area from he was 10 years old as a Life Guard in Whyalla Australia. 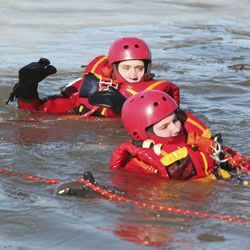 As a result of many years in the rescue world we have developed one of the biggest Water Rescue Teams in the UK and Ireland from Water Awareness to Rescue Technician course. The courses offered by Emergency Fire & Safety can be delivered anywhere in the UK & Ireland and Globally as well. We have a team of specialist Water Rescue Techs that can manage and carry out your water rescue stand-by Services. Our courses are suitable for those who have never carried out any level of water Rescue training, to those whose skills need refreshed. With many workers and general public being drowned every year ROSPA and WAID statistics are as follows. 2010 –657 deaths in and around water. With that in mind this is a skill that will stay with you for the rest of your life. Also if you simply follow the rescue formula below you will know where your companies limitations are or weaknesses’ are. The Rescue formula, it is useful to apply the following alternatives for action to any rescue in water. As you examine them you will notice that some of them are within your skill range and some that require additional equipment and training.